1.This wig hair was processed by 100% Chinese virgin hair, which means the hair with cuticle, root and tip run in the same direction. 2. This Coarse yaki mimic African american hair, very natural looking ! 3.Regular full lace wig And Glueless full lace wig, 100T hand tied unit!! 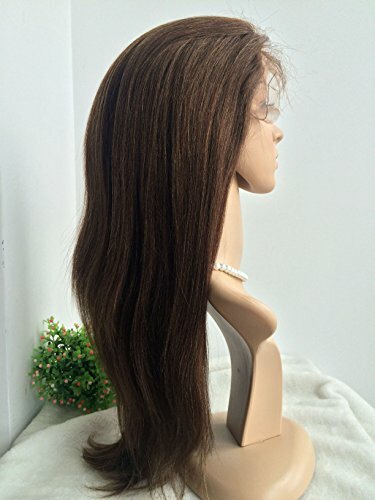 4.Tangle free,no shedding The Most realistic Silk top lace wigs, There is no other ventiation technique that creates a more flawless appearance than hidden knots on a silk top. you don't need to bleach the knots, you don't need to worry about any other techniques to make the knots invisible or less visible. We have more than 2000 Silk top units in stock, can be shipped immediately!! (silk top need extra fee). Hair Care Tips: once u received ur wig, 1. You can use knot sealer to seal your knots on the underside of your wig after every washing. 2.u can wash it with a little coconut oil and wig shampoo. After washing, when hair is 60% wet, u can spray it mixted liquid (coconut oil with water) it will become smooth and gorgeous. 3. when cleaning wig, pls keep water tempearture in 40-50 degree. 4. But when conditioning, water temperature needs to be 50-60 degree 5. (best temperature for wig to take in oliver oil and conditioner), 5 minutes for conditioning. !!! : Please use neutral shampoo And spring water or distilled water. Attention please: Don't use Tap water, the tap water filled with many chlorine and chemicals!! which can cause tangling!! chinese virgin hair,glueless full lace,no silk top,18inch,#4,medium cap size,medium lace color. with perimeter bleached knots and baby hair,very natural and realistic. Processed by 100% Chinese virgin,no shedding,no tangle. The Natural hairline,with Natural baby hair all around. The Most comfortable Glueless full lace wig cap. If you have any questions about this product by April Silk Top Wigs, contact us by completing and submitting the form below. If you are looking for a specif part number, please include it with your message.